Elyse and Ian prior to the formal dinner evening - he's such a great big brother! Three years ago about this time of year it had been another cold, long winter, and my sister and I were anxious to go somewhere warm. Long story short, we decided at the last-minute to go on a cruise, so we got the ball rolling and in addition to my sister and myself, my Mom, my brother Tim, my sister-in-law Joanie as well as Ian and Elyse, we all went for a seven-day trip on Royal Caribbean’s Enchantment of the Seas. Spring break for schools was a little late that year. My other sister-in-law Lucy, is a cruise agent extraordinaire with Ship-A-Hoy, and does a wonderful job of booking great staterooms, knows all the scoop on the excursions and ports of call, and is awesome at handling all the in’s and out’s of cruising. She’s our favorite cruise agent of course and we’ve been on many! She was able to find us a great cruise at the last-minute to the ports we wanted to go with some good amenities for teens. 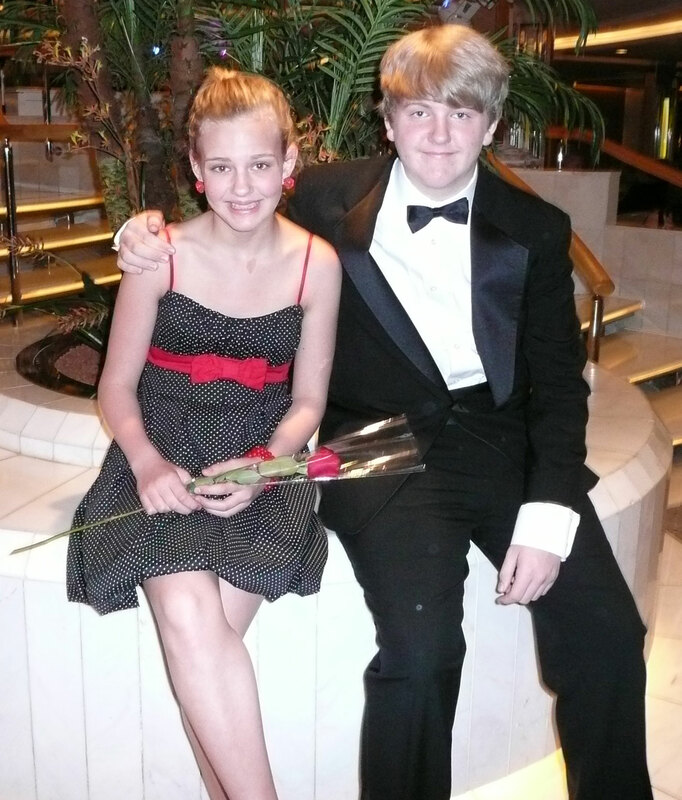 Ian and Elyse had a blast (they were seventeen and thirteen then). 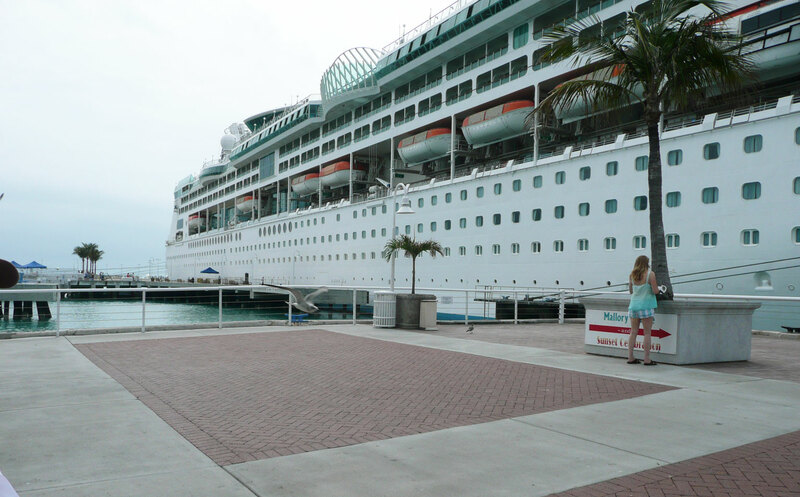 Our ship, "Enchantment of the Seas" in port at Key West. We left from Fort Lauderdale and sailed to Cozumel, Belize and Key West with a couple of days at sea in between before arriving back in Fort Lauderdale. I won’t go into detail about the cruise, but want to share a specific event that involved Ian, and demonstrates what a good sport he is, and how easy-going and mature he can be, despite the fact that he was totally humiliated (so he says now!). Tim, Joanie and I decided to check out Royal Caribbean’s notorious “Quest” game that was scheduled one night, as we had heard chatter that it would be hilarious. Mom and Deb didn’t want to go, so they kept an eye on Elyse, and finding out that we needed four people to play, we grabbed Ian, even though he was less than 18 years old and it was noted for “mature” audiences. 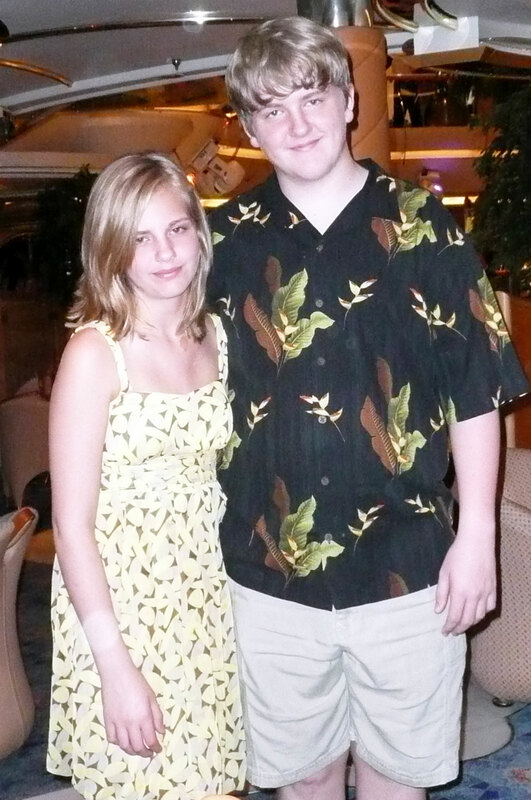 Elyse and Ian in tropical attire! We didn’t know what to expect and it started as sort of a combination scavenger hunt with “Let’s Make a Deal” (where you won something if you had it in your purse or pocket) and you were among the fastest to get it to the emcee, with the chance of winning a cheesy Royal Caribbean trinket. You had to appoint one guy on your team as your runner, and we elected Ian to do it. The game got progressively funnier and more challenging for the male runners and audience alike. It started with innocuous things you’d find in a purse, but quickly took a raucous and embarrassing turn for the assigned runners, poor Ian. First the team had to find a tube of lipstick (both Joanie and I had some), then Ian had to put some on and run to the emcee. Ian then had to find a pair of earrings, put those on and race to the front. Joanie and I both have pierced ears, but I had on a pair of grey pearl leverbacks, that he was able to put and keep on. Each task got a little more complicated – the guys had to take off their shoes (and socks for some), then put on a pair of high heels and once again, run to the front. Seeing these men with lipstick and earrings on, running in high heels was a side-splitting sight! Again, Ian was having fun, and wasn’t too self-conscious since men of all ages were doing this. He just happened to be the youngest! Ian is somewhere in that crowd, I have close-up pictures, but promised him I'd never share! But then the emcee announced that one of the women in the team had to figure out a way to take her bra off, without taking her shirt or dress off, then the team runner had to take his shirt off and put on the bra. Then the runner had to find a purse and run to the front to get a number from the emcee (while still in heels, with earrings and lipstick on). Once all the guys had a number, the emcee had them do a conga line dance around the room. The best “dancers” were chosen and announced by number by the cruise staff. I was laughing so hard I was crying and couldn’t catch my breath watching Joanie rapidly slip off her bra from under her dress and pulling it out of an open armpit. My brother was laughing so hard as well. Joanie and I quickly put her bra on Ian, snapping the back in place. I gave Ian my purse to carry, and once ready, he flew over the chairs/section we were sitting in to go grab his number. The music started and the guys all danced in a line, holding onto the hips of the guy in front, with the emcee leading the conga line. Then each guy had to do a 10-15 second solo dance. It was hilarious. All along I was taking pictures of course! I’ve shared just one here of when all these macho guys rushed in their heels, bras, earrings with purses in hand to get their numbers. But I also have several of Ian close-up which I “triple” promised him I would never show to anyone outside of the family. Well I’m keeping my promise (at this time), but have kidded with him that I might pull them out for when he gets married one day. Hmmm, someone should have color-coordinated this group! Doing the "Macarena" in the dining room one night, LtoR, my brother Tim, my sister Debbie, my nephew Ian and my sister-in-law Joanie. I’ve heard that on some of the other Royal Caribbean cruises, the guys have to strip down to their skivvies while wearing the bra, heels, purse, earrings, lipstick and dancing the conga. You’ll find evidence of this on YouTube. Ian had on a pair of cargo shorts, but he and all the other guys on our cruise kept their pants on! We caught up with my Mom, my sister and Elyse later, still laughing, showing them the pictures. Ian lamented to his Grandma, “I’ve never been so humiliated in my life!” Please don’t tell anyone about this! (He was a senior in high school after all.) But he still laughs about it today, was such a good sport about it and had as much fun as anyone. 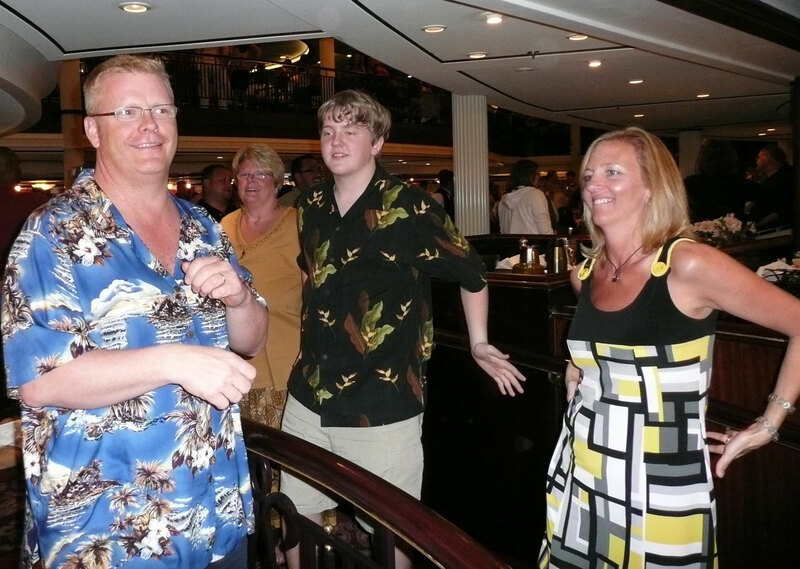 The game also set the tone for the rest of the cruise, where we continued to have a great time – and we continued to enter as either a family team or as solo entrants in the ship’s other contests, from “Name That Tune” (2nd place!) to karaoke. But nothing was as funny as seeing Joanie slip her bra off through her armpit and then to see Ian put it on and strut around doing the conga in high heels. As adults one of the clearest and most positive memories we have of our childhood are of family vacations. Hopefully this will be one to remember for Ian. And if he forgets, I have pictures!